BSL Fishing Report - 09/07/2013 - - - 4 messages. Showing 1 through 4. Went up to the home lake on Saturday. Things started off pretty slow but the wind picked up and we managed to get 7 in the well. Caught around 14 altogether. Had to throw a couple back because they were either too big or mostly too small. Used pretty much dead leeches cause that's all we could get. A trick that seemed to work though, is we threw some ice cubes in the leech locker and threw them in the freezer for around 20 minutes. That got them wiggling again That must of worked because when we went out again, we actually caught some fish! They were all 'eyes except for one really nice smallie that Tap caught. Ahhh but your so cute!!!! Nice report. F.I.L. 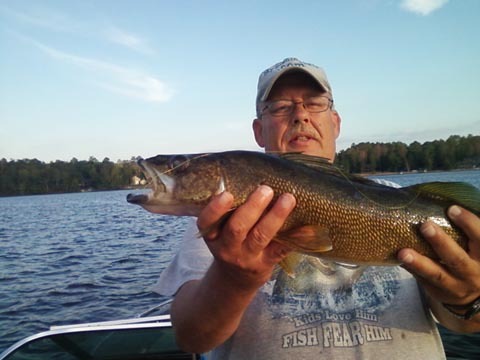 and I have been fishing Big Sandy most weekends since August but we aren't having quite the success you are, 2-3 in the well per day is typical with 3-4 12 incher in between every keeper. We've been mainly fishing mornings and evenings, save midday for chores. Our best luck has been on the wind beaten shores, bars, and points, 6-18 FOW. We were able to get a 1/2 pound of leeches at Willy's back in August that was actually jumbo size and they've kept well in a big bucket in the fridge, with periodic water changes. Chartreuse jig/leech has been producing a few more of the keeper+ walleyes, chartreuse or green hook and leech is producing the numbers. 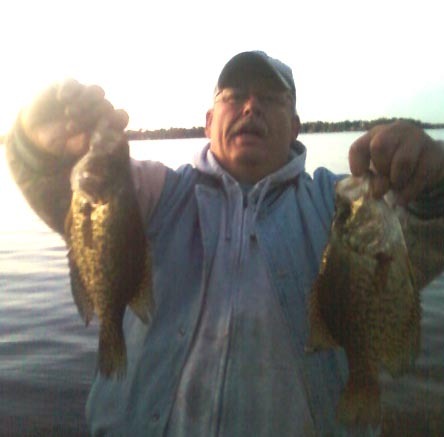 Occasional crappies being snagged at 20 FOW, ripped the hook out of a few.